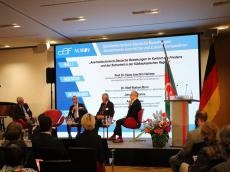 The conference was held with the organizational support of the German-Azerbaijani forum and the NUMOV (German Near and Middle East Business Association) society and the support of the Agstafa Agro-Industrial Complex LLC. Speaking at the event, the Azerbaijani Ambassador to Germany Ramin Hasanov appreciated the current state of relations between the two countries, noting the political dialogue at the highest level, the visit of President of Azerbaijan Ilham Aliyev to Germany, the visit of Federal Chancellor Angela Merkel to Azerbaijan. The ambassador also touched upon the fair position of Azerbaijan on the Armenian-Azerbaijani Nagorno-Karabakh conflict. In turn, Thomas Oppermann emphasized the geo-strategic and economic importance of Azerbaijan for Europe. He called Azerbaijan an exemplary country of the Islamic world thanks to its traditions of tolerance. Then the event continued with panel discussions. In discussions on peace and security in the South Caucasus, the Member of the Azerbaijani Parliament, the Deputy Chairman of the OSCE Parliamentary Assembly Azay Guliyev stressed the importance of implementing the principles of international law in resolving the Armenian-Azerbaijani Nagorno-Karabakh conflict. He noted that if Armenia does not want peace voluntarily, pressure should be put on it. Guliyev also noted the importance of more active participation of Germany in the settlement process as a member of the Minsk Group. The Member of the German Parliament, the Chairman of the Germany-South Caucasus Parliamentary Friendship Group Johannes Kars said that it is necessary to increase diplomatic efforts for the peaceful solution of the conflict. He added that in the process of resolving the conflict, apart from the parties to the conflict, there are other interested parties, which makes it difficult to resolve it. Former State Secretary of the Ministry of Foreign Affairs of Germany, Member of the NUMOV Society’s Advisory Council Wolf Rutold Born, stressed that the principles of international law were violated in this conflict, and noted the importance of observing the Madrid principles when resolving it. The book in German by Mamed Alizade entitled as "Golden Pages of History", which tells about the history of German settlements in Azerbaijan, was presented at the event. The event was attended by members of the Azerbaijani Parliament, representatives of the German Parliament, the Foreign Ministry and other German government agencies, employees of the Azerbaijani embassy to Germany, as well as representatives of Germany’s political, economic, cultural and media circles, representatives of the Azerbaijani diaspora.